Price targets can help protect profits and prevent large losses. The price target of a stock is the price at which the stock is fairly valued with respect to its historical and projected earnings. Investors can maximize their rates of return by buying and selling stocks when they are trading below and above their price targets, respectively. Research analysts often publish stock price targets along with buy-sell recommendations. However, investors can and should determine their own price targets for entering and exiting stock positions. The first step is to determine a stock's fair value. This involves estimating future earnings potential by reviewing historical results, economic conditions and the competitive environment. A stock's price target can be a multiple of the price-to-earnings ratio, which is the market price divided by the trailing 12-month earnings. This multiple could be the industry multiple, the company's earnings growth rate or a combination. For example, if a company's annual earnings growth rate is 10 percent and the stock is currently trading at $20, then a possible one-year price target could be 1.10 multiplied by $20, or $22. Similarly, if the industry price-to-earnings multiple is 18 and the company expects to earn $1.10 over the next 12 months, then another possible price target would be 18 multiplied by $1.10, or $19.80. Investors could set buy and sell price points around target prices to maximize returns. The ideal time to buy a stock is usually when it is trading at a substantial discount to its target price. This discount could be the result of weak market conditions or overreaction to recent company setbacks. 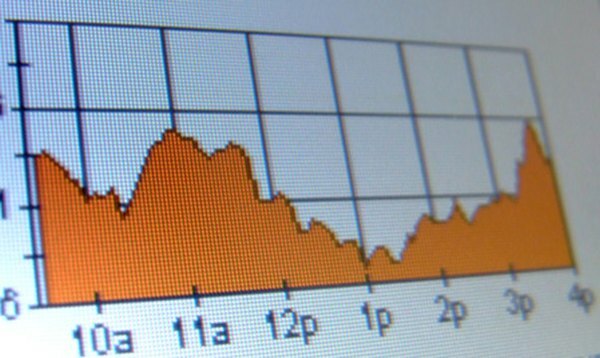 The ideal time to sell a stock is usually when it is trading higher than its target price range or during overheated markets. Continuing with the earlier example, an ideal entry point could be between $15 and $18, while the time to reduce positions might be when the stock is trading higher than $25. Investors should not try to time markets because it is impossible to predict the troughs and peaks consistently. Instead, they could set price alerts -- email reminders sent from brokerage accounts when certain price levels are reached -- or place limit or stop orders. Continuing with the earlier example, an $18 price alert would notify investors when the stock price might have become undervalued. Limit orders execute at specified limit prices, while stop orders become market orders at specified stop prices. Investors could use these orders to buy into a stock when it is about to break higher or sell before a sharp price drop. Investors should use price targets and recommendations from analysts as one of several data points. Some analysts work at independent research houses that sell their research services for a fee, while others work for financial institutions that have ongoing relationships with the very same companies that the analysts are covering. Investors should use these recommendations as one part of the due diligence process, which should include reviewing financial reports and regulatory filings on the investor relations sections of corporate websites.